With sadness, the family announces that after battling cancer, Frank Zimmerman passed away peacefully on March 29, 2017, at the Marjorie Willoughby Hospice Home in Kamloops, BC. Frank is survived by his wife of 40 years, Dianne Zimmerman, of Kamloops, his 4 children; Jerry Zimmerman of Utah, USA, Barry Zimmerman (Cindy) of Chilliwack, BC, Patty Zimmerman of Abbotsford, BC, Kerri Zimmerman (Rob) of Calgary, AB, his 5 step-children; Judy Paquin (Noel) of Kamloops, BC, Terry Olsen (Rob) of Jasper AB, Linda Strate of Kamloops, BC, Bill Witwicky (Faii) of Thailand and David Witwicky (Cheri) of Kamloops, BC. Frank also leaves behind 12 grandchildren and 7 great-grandchildren. Frank was predeceased by his first wife, Joyce Zimmerman, brother, John Zimmerman and sister, Terry Oliver. Frank was born February 4, 1931 in Winnipeg Manitoba to John and Theresa Zimmerman of Hungary. At 18, Frank joined the Canadian Armed Forces and served as a Gunner until 1953. As a young man, he worked at various jobs before finding a career as a locomotive engineer on the CN Rail. After 38 years on the rail road, Frank retired early to enjoy life. Frank loved to drive and he and Dianne travelled all over BC, many parts of the Prairies and down South, over the years. It wasn’t long before Frank realized that he missed working and went on to flag on BC Highways and finished his working career, at age 80, with Enterprise Rent a Car. 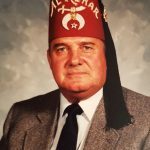 Frank was a member of the Gizeh Shriners of Kamloops, Royal Arch Masons of BC and spent many summers parading with the Keystone Kops Association of Kamloops. Frank was a devoted volunteer with the Freemason Caner Car Program. He was a man of few words and fondly remembered for his “bark that was worse than his bite” but those who knew him well knew that he had a heart of gold and would do anything for his family. Frank loved Cadillacs and good shoes! The family would like to send a sincere thank you to the nurses and staff at Marjorie Willoughby Hospice Home for their support during a difficult time. Condolences may be sent to drakecremation.com. In lieu of flowers the family asks that you donate to Freemason Cancer Car Program or the Marjorie Willoughby Hospice Home, both of Kamloops BC. On behalf of Earl Merryfield, our family is sending our heartfelt condolences to the Zimmerman family. I recall the time we all spent in Grimshaw when Frank & Earl worked together and the picnics at Cardinal Lake. Mom & Dad lived in Blossom Park close to Frank & Diane where the two of them were very actively involved as Shriner’s.